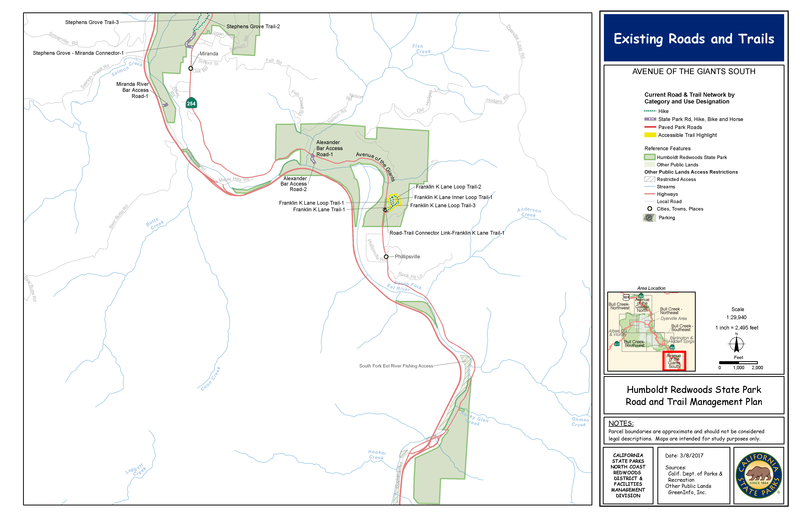 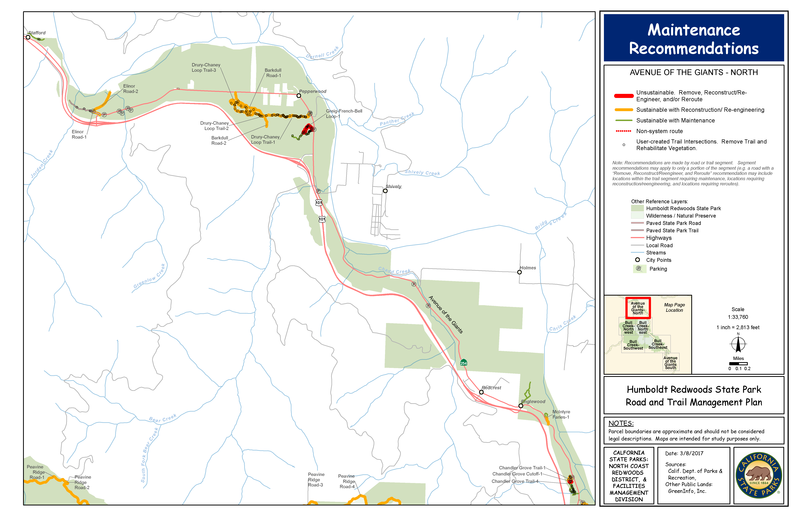 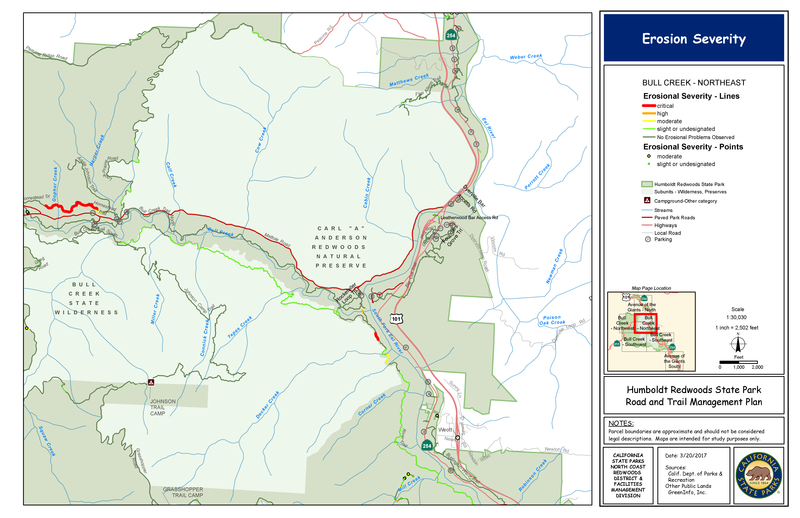 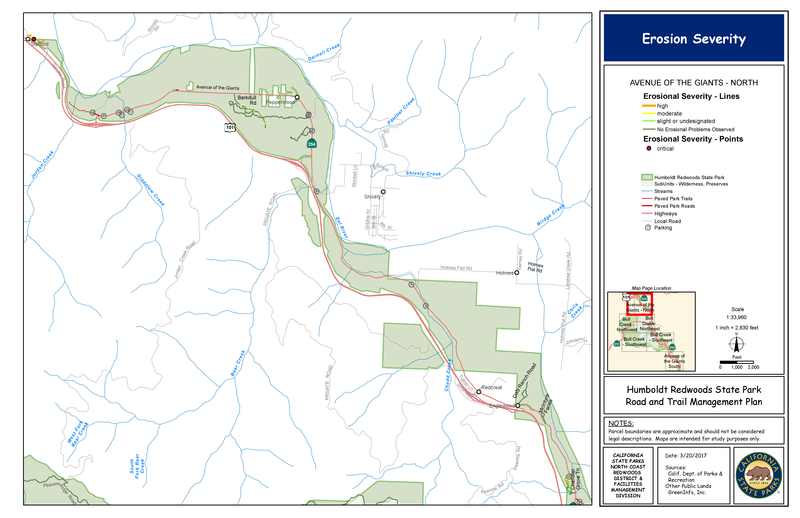 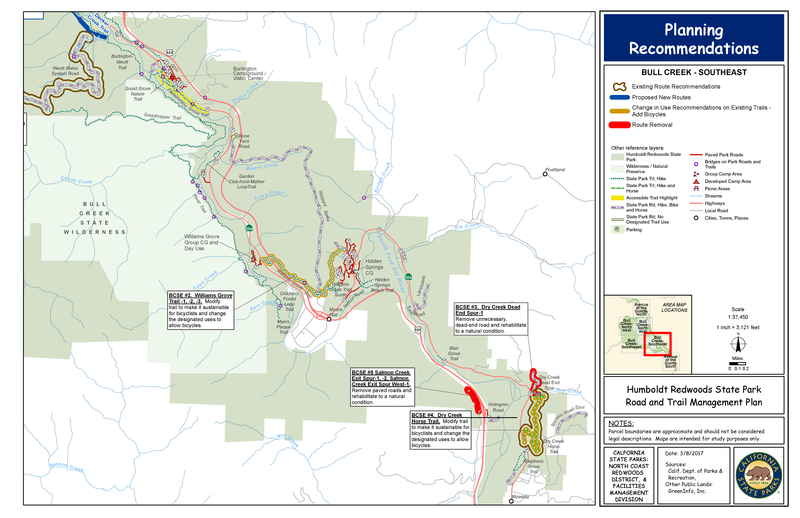 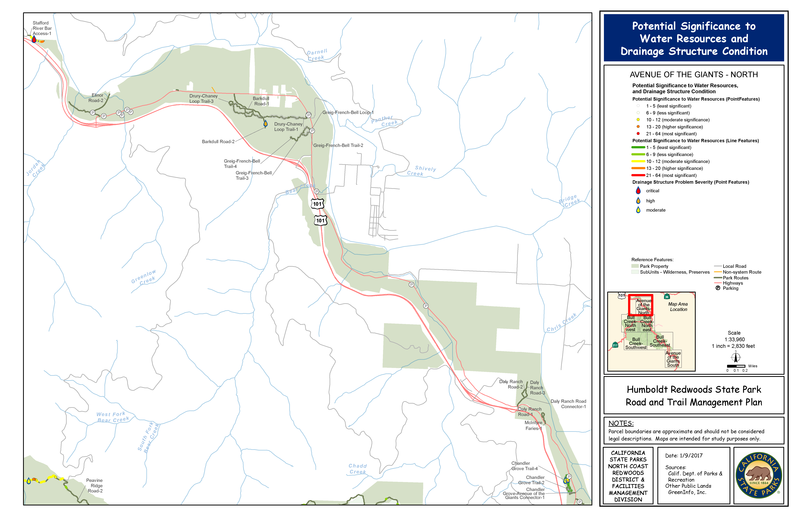 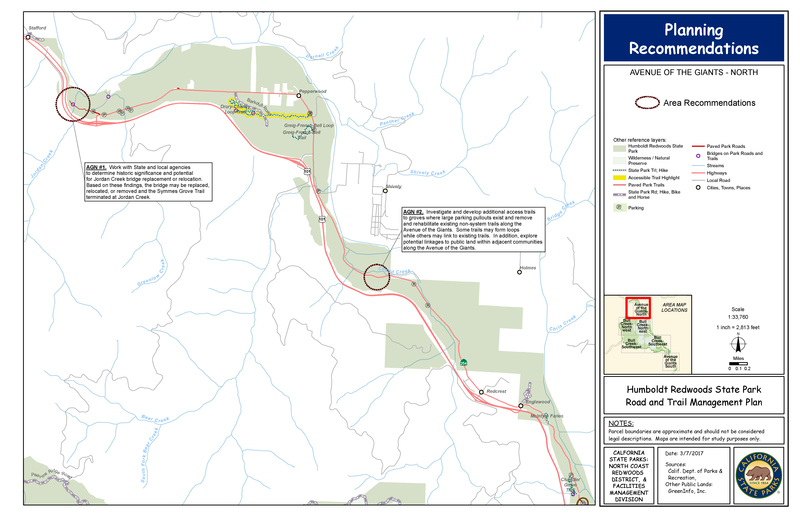 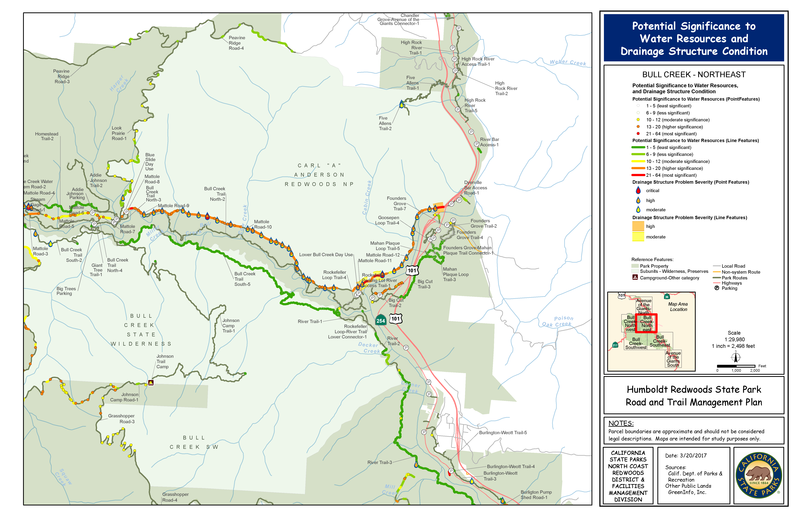 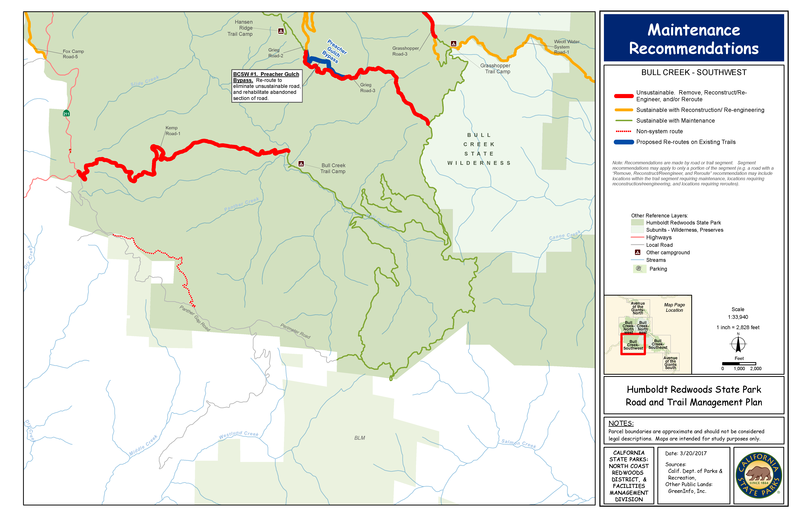 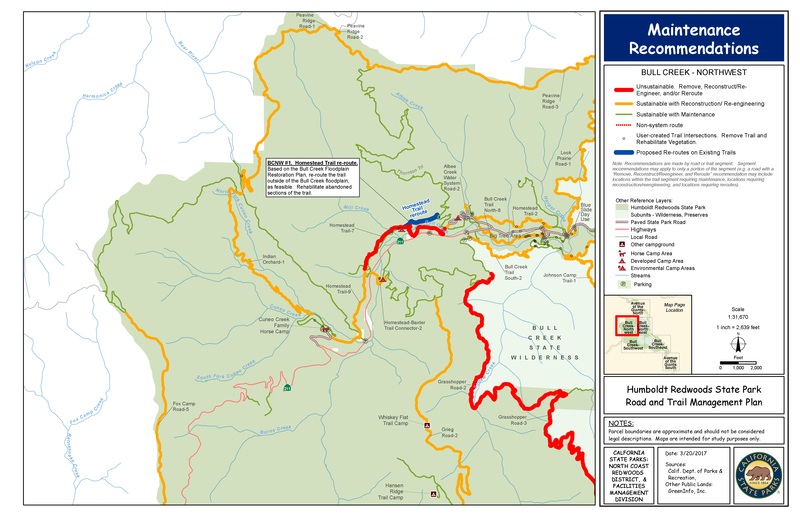 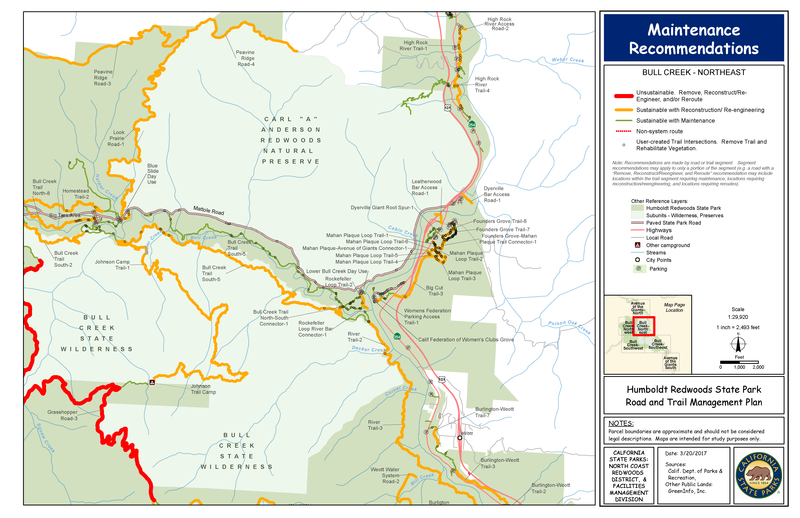 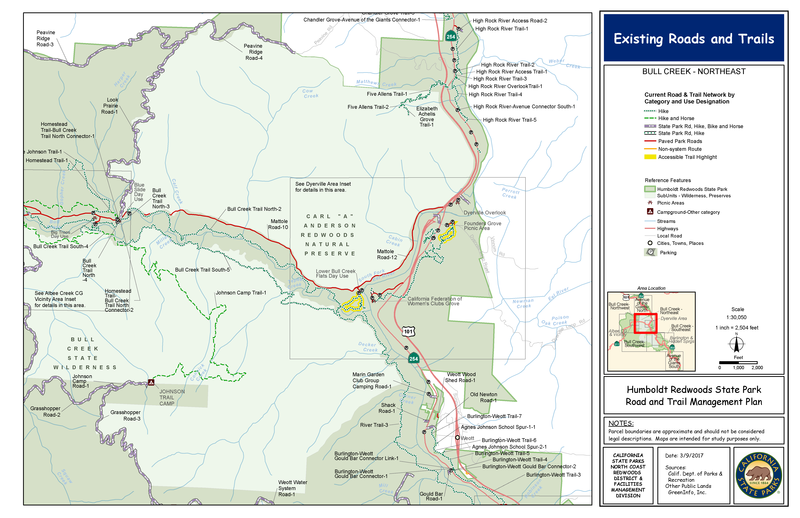 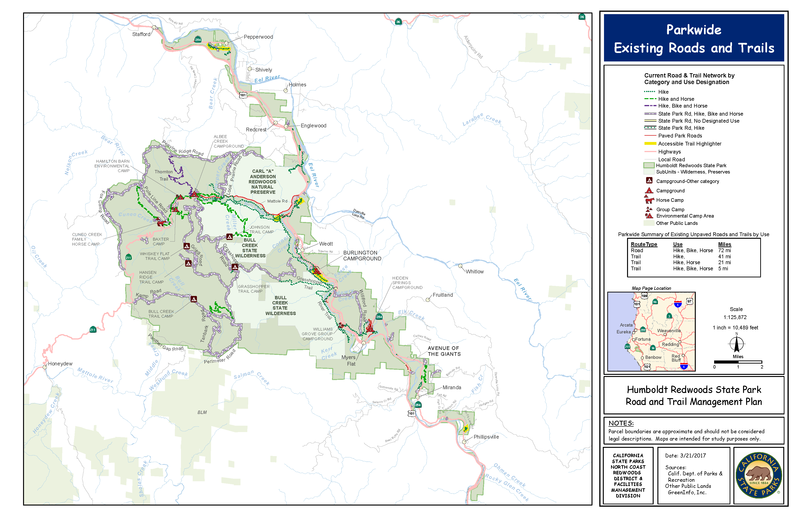 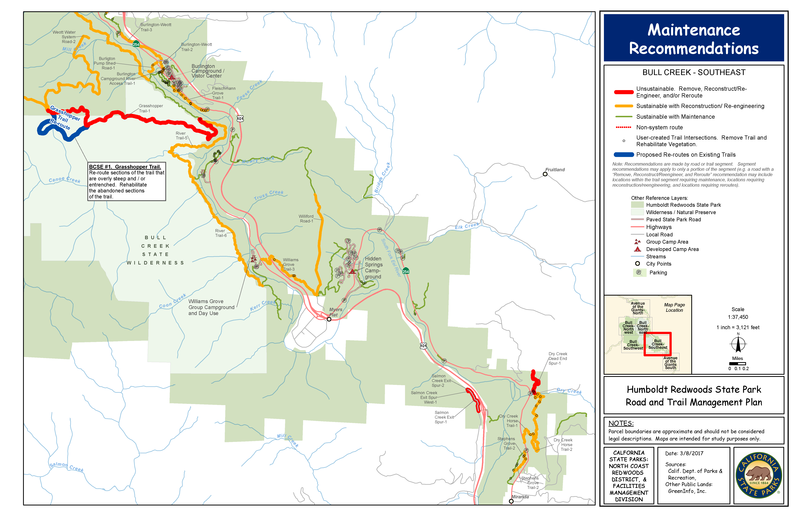 A draft of the Humboldt Redwoods State Park Road and Trail Management Plan and associated CEQA Initial Study and Negative Declaration has been released. 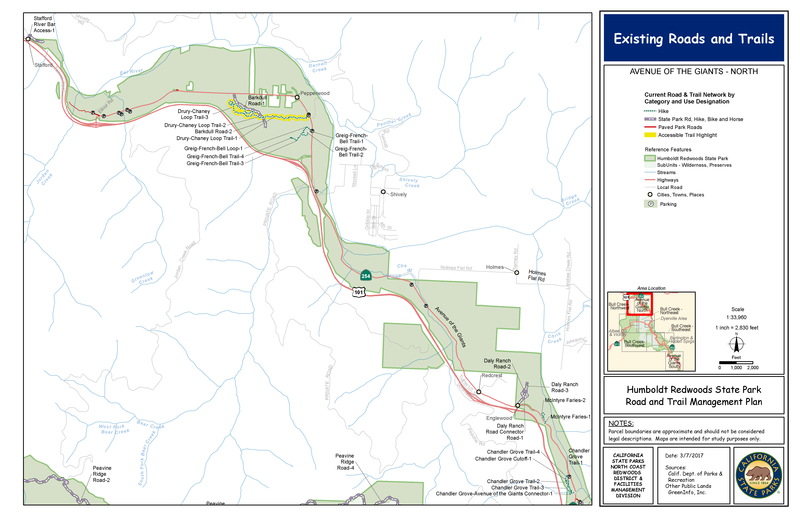 The Notice of Availability and Intent to Adopt is available here. Written comments will be accepted through March 4, 2019 and may be submitted to Trails@parks.ca.gov or North Coast Redwoods District, California State Parks, PO Box 2006, Eureka, CA 95502-2006. 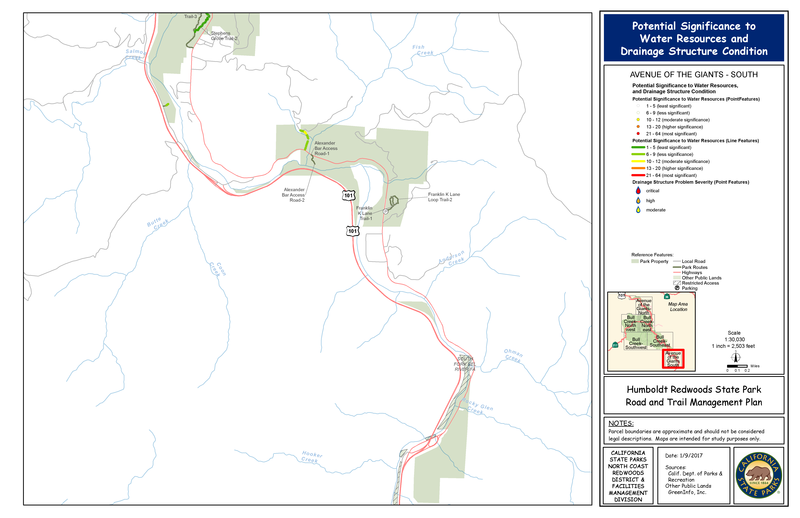 A previous draft of the Road and Trail Management Plan was released in April and comments were received. 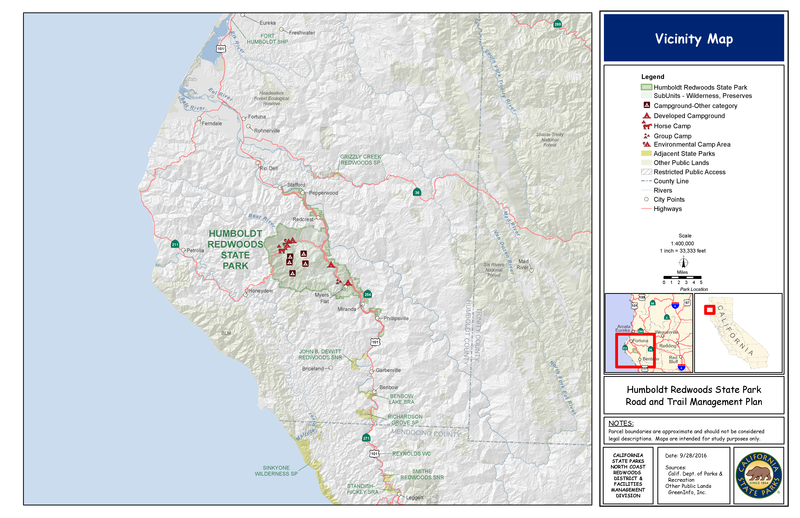 The Department's response to comments can be downloaded here. 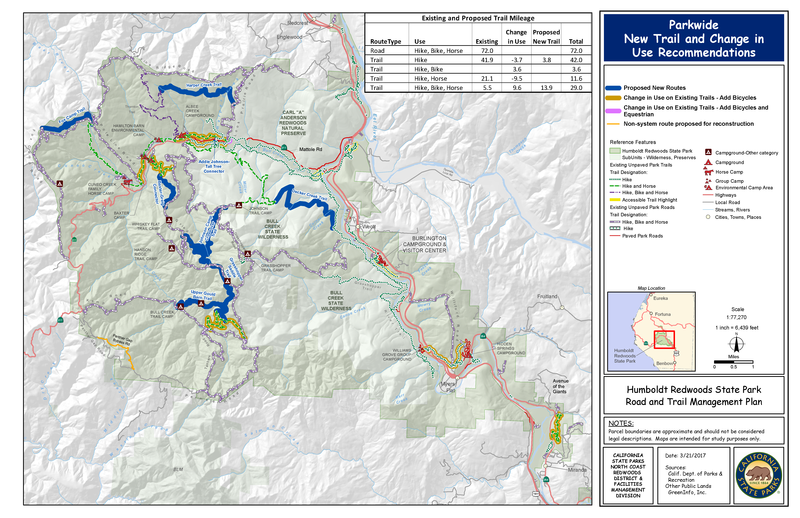 The Humboldt Redwoods State Park (SP) staff has developed a management plan for the park’s system of roads and trails. The park has 50 miles of roads and 60 miles of trails for public use in the coastal mountains of southern Humboldt County, 40 miles south of Eureka, eight miles north of Garberville, and 240 miles north of San Francisco. 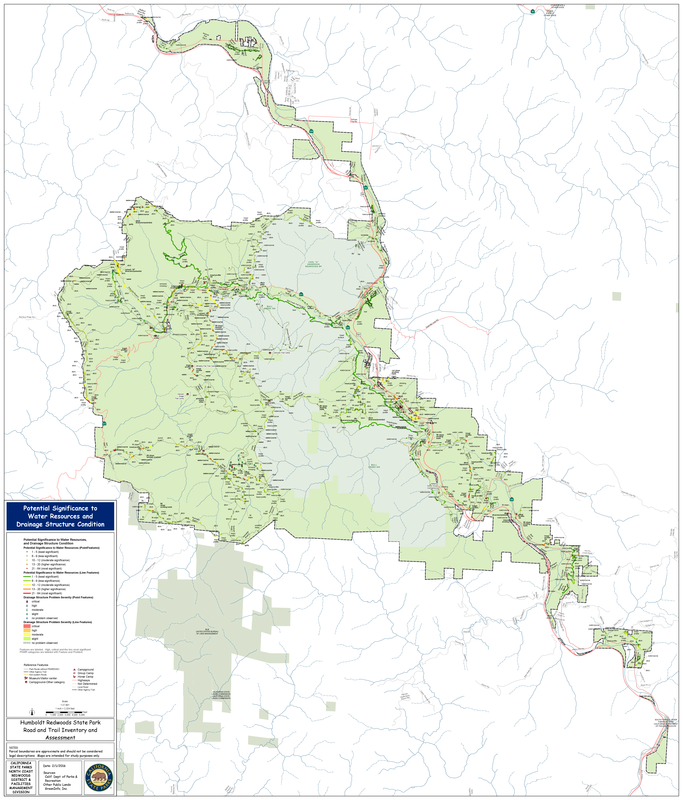 Its approximately 53,000 acres protects one of the world's largest remaining contiguous stands of ancient coast redwoods. 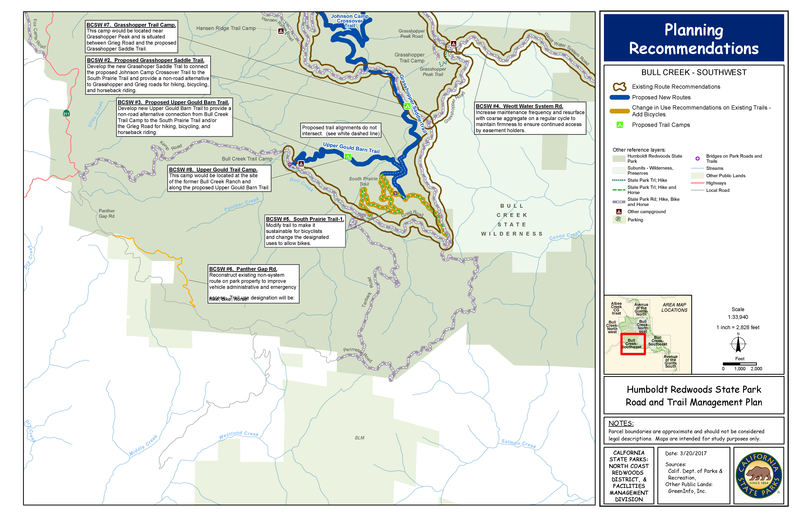 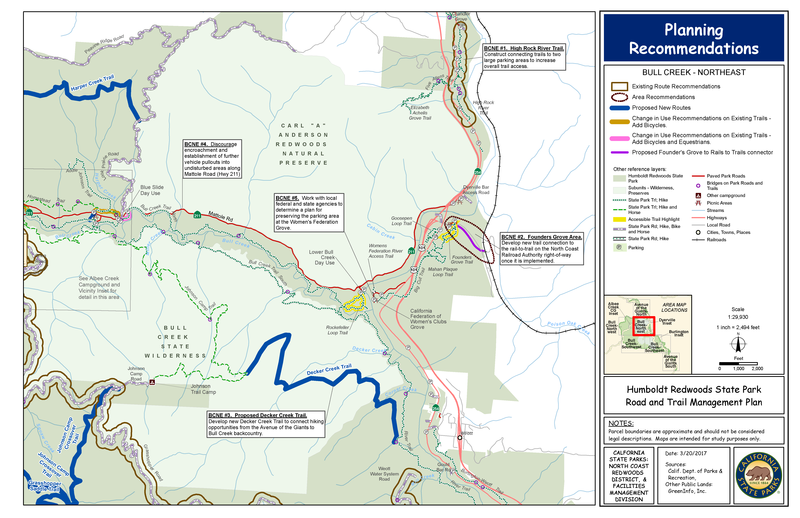 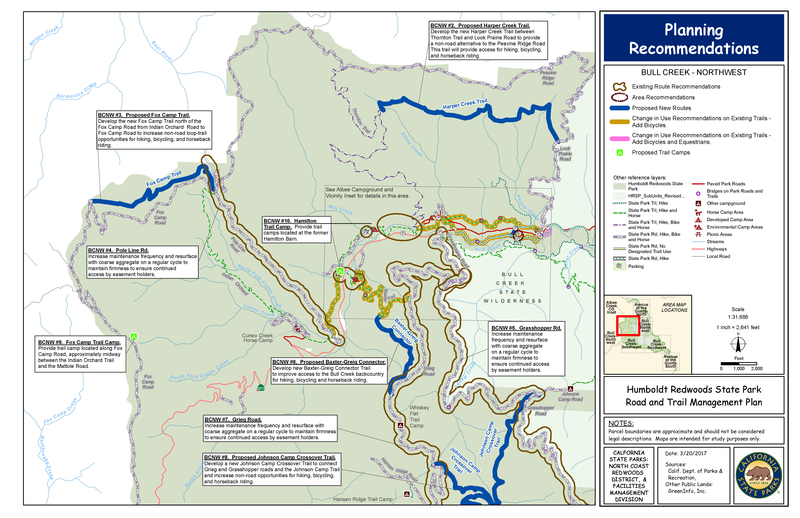 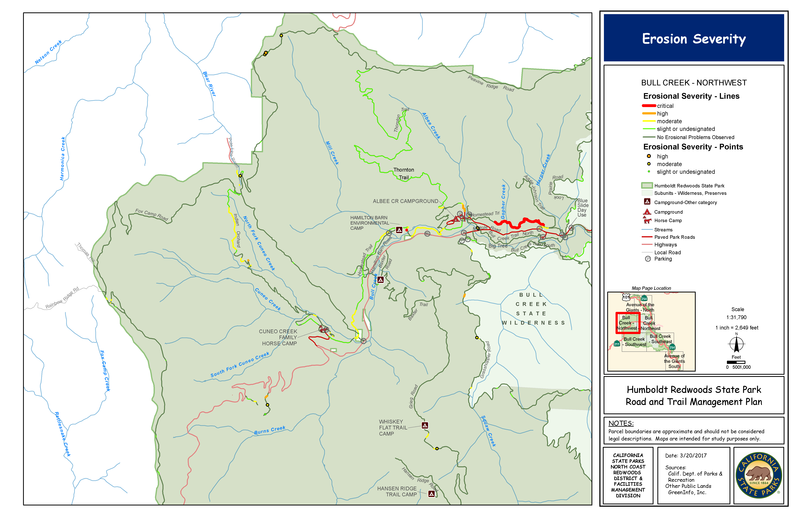 The Humboldt Redwoods SP 2001 General Plan calls to "Prepare a Trail Management Plan to evaluate the park's entire trail system and guide the placement and use of future trails and trail camps. 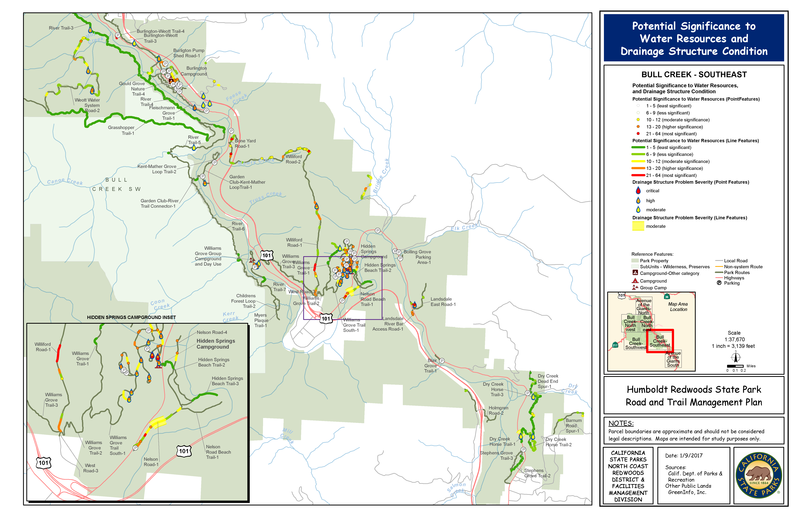 Emphasis should be placed on creating opportunities for visitors to enjoy the diverse topography, biotic communities, and scenic views at the park, as well as possible regional connections." 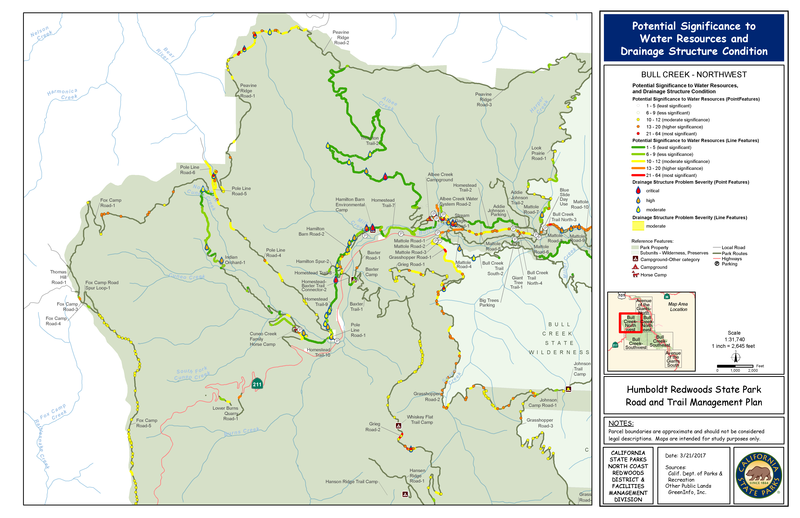 • Determine which roads and trails should be maintained, removed, and/or enhanced. 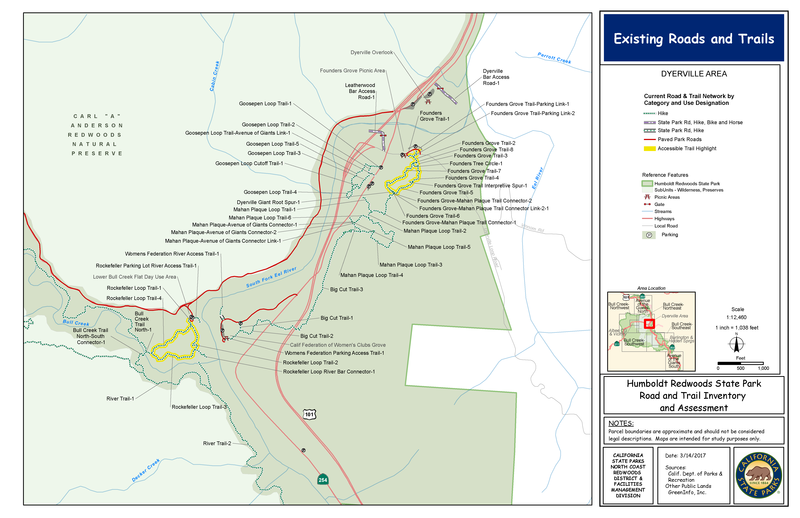 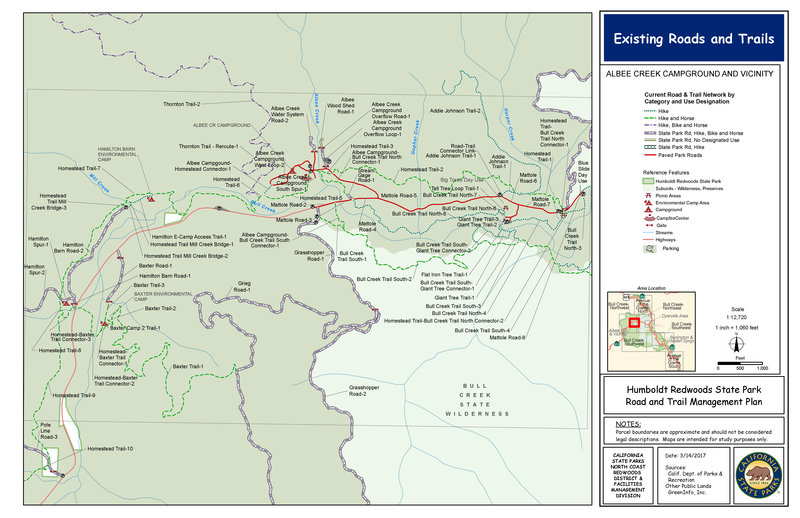 • Identify which of the unofficial trails should be removed and which should be made official. 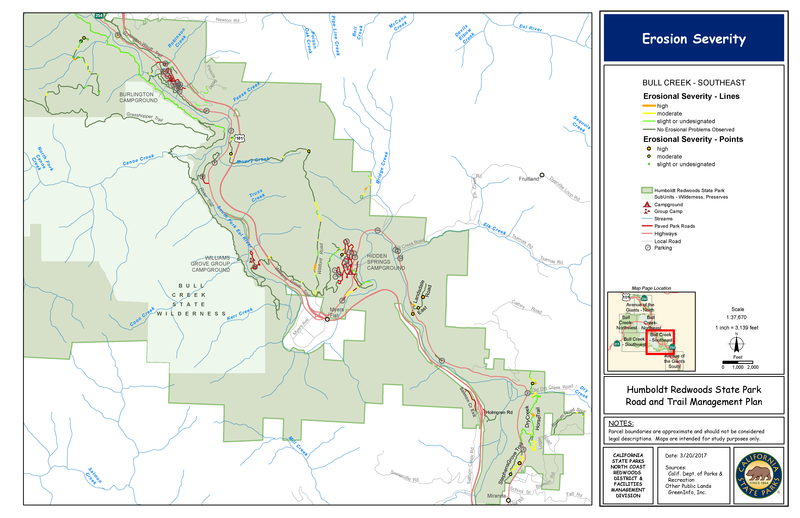 • Determine the types of trail uses (e.g. 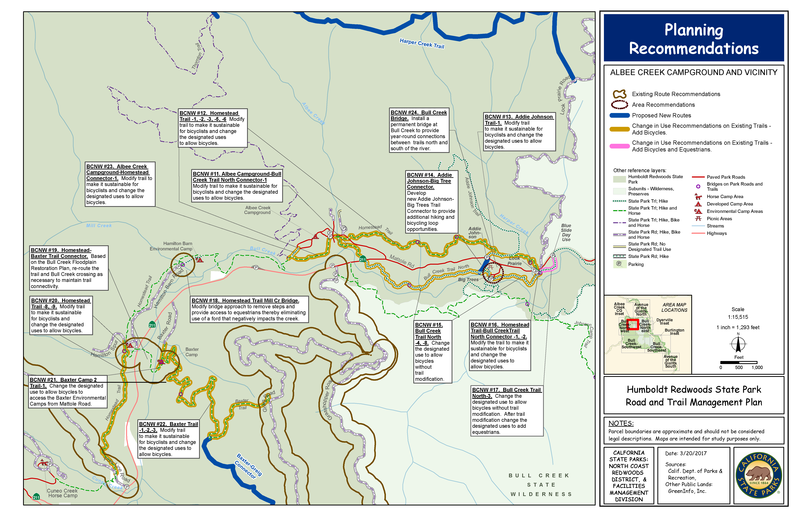 hiking, biking, and/or equestrian) that are appropriate on each road and trail. • Identify those roads and trails that lead to damage of the natural and cultural resources of the park, for example a trail that passes through an area of sensitive natural resources, and need to be re-routed and/or reconstructed. 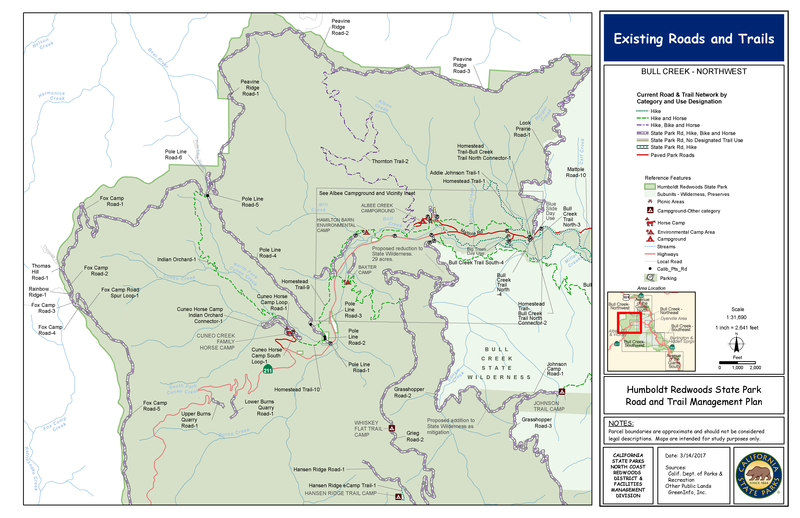 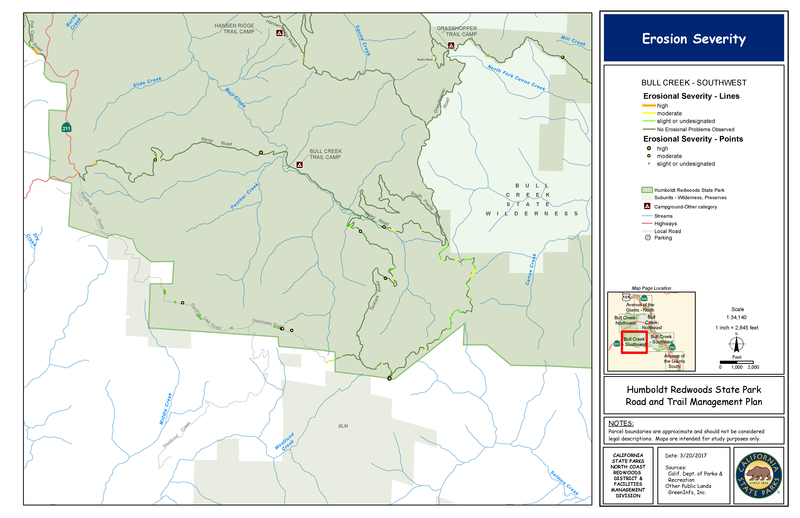 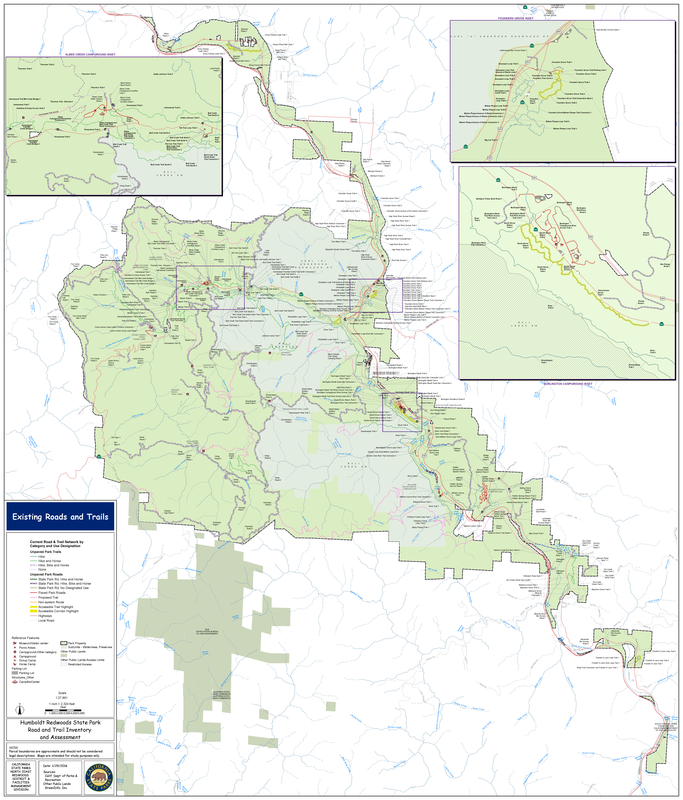 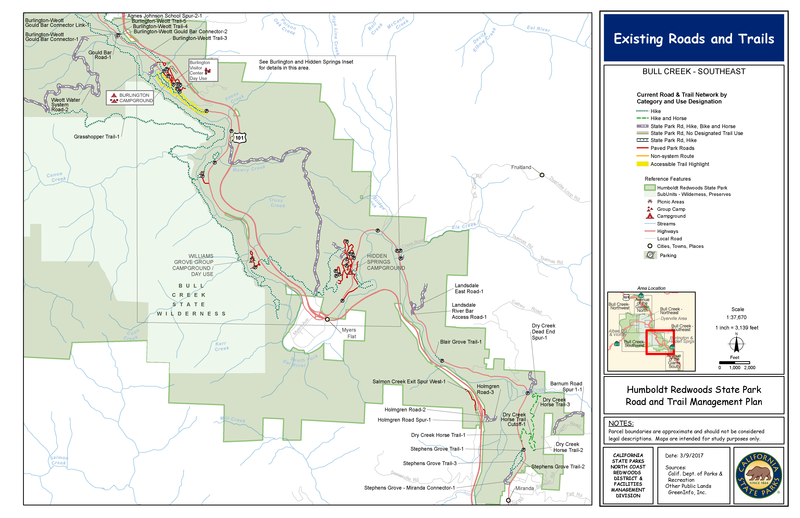 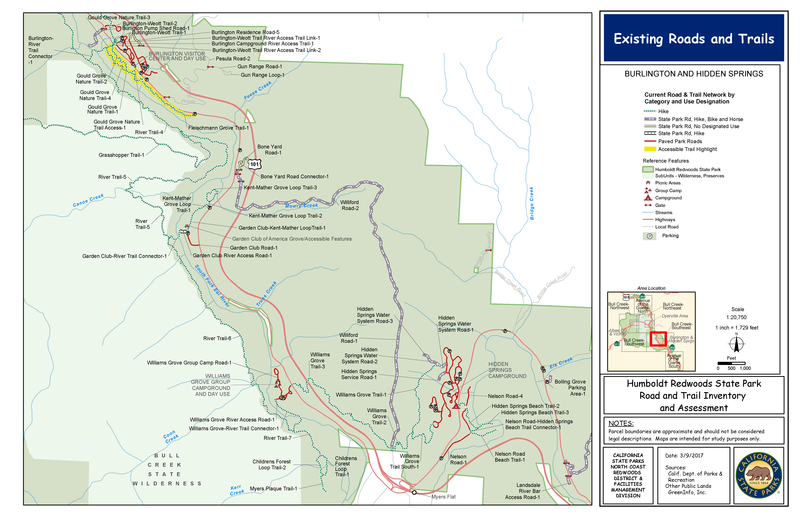 • Identify trail connections necessary to create trail loops and/or connect to trails outside the park. The first stage of the planning process is to evaluate the existing condition of the roads and trails in the park and the permitted uses of each, and develop an inventory of each road and trail feature and condition. 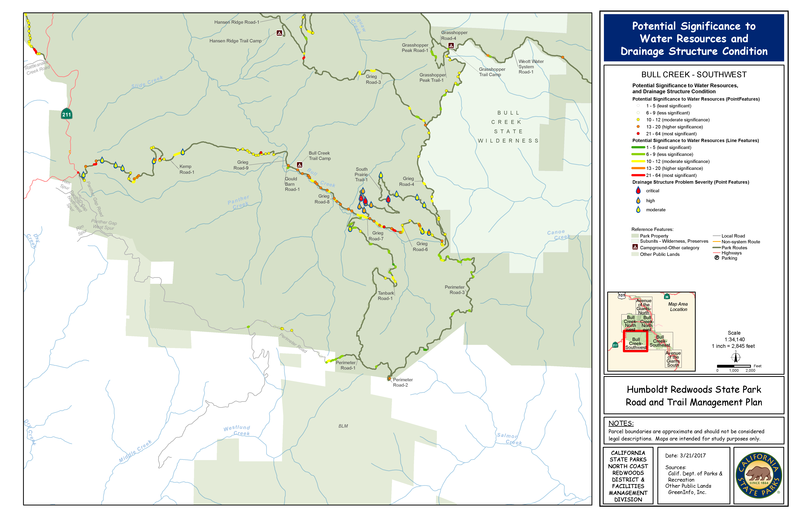 This information is then used to evaluate road and trail conditions and associated effects to natural and cultural resources. 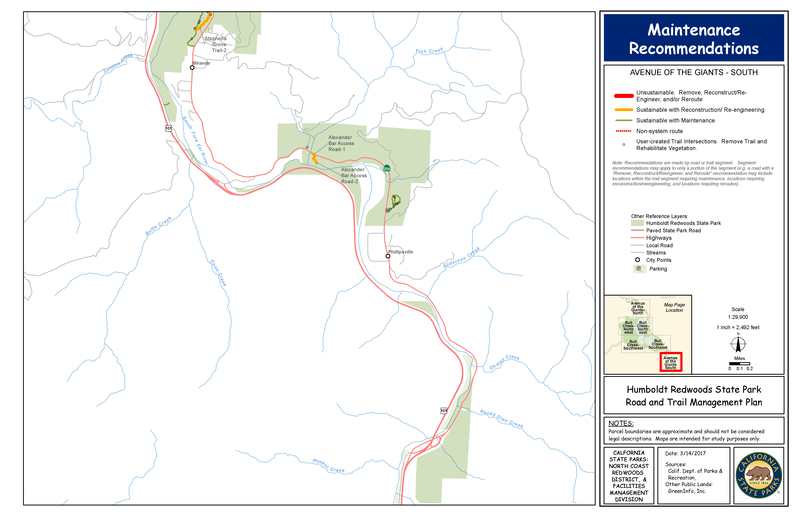 A variety of documents is developed to describe and illustrate these inventories and assessments, which can be viewed via the links below.